The government has saved the financial sector to prevent the Belgian economy from suffocating and the savings of the citizens from being jeopardised. As a result, the sector has been able to pursue its primary tasks: lending, offering payment systems and generating employment. Part of the governmental support is meanwhile being repaid at a high interest rate. During the financial crisis, the government pumped €20 billion in capital increases into financial institutions in trouble. Moreover, guarantees were offered due to which the liquidity requirements (in other words the extent to which they can meet their short-term payments) of a number of financial institutions could be bridged and the savings of Belgian savers could be protected. Part of those contributions is currently being repaid via a penalising interest rate up to 8%. This exceptionally high interest rate has the unintended effect that it demands returns from the financial institutions that are unrealistic in the present economic climate. The financial efforts made by the government were not so much made to keep the financial institutions alive but mainly to safeguard the financial system and keep the economy going, objectives that were effectively met. The financial sector has been able to continue its tasks and to play its role in the framework of the lending and payment systems. Moreover, it has continued to play the part of a major employer. Since the end of 2007, it has granted €87.3 billion in additional credits to companies, families and governmental bodies. Those credits are continuing to contribute to economic growth. A piece of KU Leuven research showed in 2011 that the financial sector accounted for one fifth of the total economic growth that took place in Belgium last year. The payment systems also play a large role in the proper operation of the economy. It is of crucial importance that the financial sector can offer innovative and secure payment transactions at any time. At no time, not even after the crisis broke out, has the sector failed to do so. In a strong economy, employment has a central place. At present, the financial sector employs about 100,000 jobs people and indirectly also creates about 120,000 jobs, especially for highly qualified people. This does not alter the fact that the employment climate is under pressure: the financial sector has trouble attracting new employees and keeping on people within a sector with a heavy workload and an image of rigidity. In the last few years the financial sector has contributed even more than before to the Treasury. 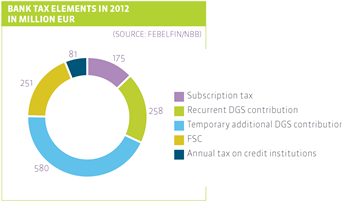 In 2011, the sector paid corporate tax, withholding tax, VAT, etc. amounting to €2.3 billion. On top of these customary taxes imposed on all companies, specific contributions are requested from the financial sector. The non-deductible VAT for financial institutions is an example, but also the bank tax. This tax is made up of four components: the contribution for a deposit guarantee scheme (DGS) to the special Deposit Guarantee Fund, the contribution for the Financial Stability Committee (FSC), the subscription tax on regulated saving deposits and the annual tax on lending institutions. In 2012, the total bank tax is costing the financial institutions €1.3 billion. As mediator between the financial and the economic actors, the citizens and the governmental bodies, the financial sector also has to play an important part in the field of taxation. It deals with most financial flows, which means it is in a position to facilitate the collection of a number of taxes such as the deduction of the withholding tax on securities or the withholding tax on professional income. In total an amount of €2.5 billion is collected via the financial sector. More and more often, the financial institutions are called on to help the tax authorities collect the various taxes. In the past few years, more information has been exchanged with regard to tax objectives. This exchange takes place automatically (for example due to the fact that citizens are being obliged to declare their foreign accounts to the National Bank of Belgium) or at the request of competent bodies (for instance if banking secrecy is cancelled on suspicion of fraud). The financial sector is currently developing a number of proposals to simplify the procedures in this matter.